DESCRIPTION: The F-16 is one of the most commercially successful jet combat aircraft. It has provided a long life that promises to have many more years to run, and it has been adopted by many air forces. This new Haynes Owners’ Workshop Manual provides a rare view of this important aircraft, making full use of an established format that includes lavish illustration with photographs, drawings and sketches. The story begins with the Viper story and the attempts of the US DOD to encourage development of a lightweight fighter that employed state-of-the-art technologies, but achieved a relatively low unit cost. The manual summarizes the Block construction process from Block 1 to Block 50. The International version are given their own chapter and a set of chapters follows, covering Block 40 through Block 52 at war. 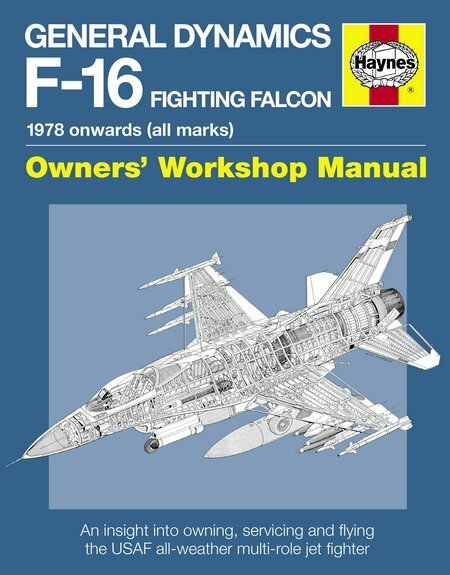 From there, the familiar Haynes approach to workshop manuals looks at the anatomy of the F-16, the engines, the pilot’s view and maintaining the aircraft. The result is a very effective review of the F-16, ending with Appendices for the fine detail. This is yet another very valuable addition to the Workshop Manual series. The standard of illustration is a great strength, adding to the detailed text. An excellent book that will be greatly valued by aviation enthusiasts.